The Official 2017 White House Christmas ornament honors the administration of Franklin D. Roosevelt, who served as the thirty-second president of the United States from 1933 to 1945 and his remarkable journey to restore the faith of the American people. The ornament is crafted from shiny brass plated with nickel and 24-karat gold. The ornament was designed using elements unique to the life and legacy of President Roosevelt. The eagle cartouche emblazoned on the speaker’s stand at President Roosevelt’s first inauguration is the inspiration for the main element of the 2017 ornament. The two flags below have forty-eight stars each, representing the number of states in the union during Roosevelt’s four terms. The shape of the ornament is reminiscent of the silhouette of a tabletop radio – similar to those many Americans had in their homes and used to listen to the president’s reassuring Fireside Chats. Roosevelt’s beloved Fala is pictured on the back of the ornament, sitting next to a festive Christmas tree and presents. A white leaf motif accenting the ornament edges is based on exterior stone molding that adorning the White House north entrance. Four stars toward the top of the ornament represent Roosevelt’s historic four terms as president and the chevron border recalls the design of a card case he carried while serving in office. Since 1981, the White House Historical Association has honored a different presidential administration and historical White House event by selling the Official White House Christmas Ornaments. 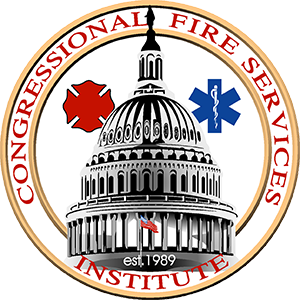 By purchasing an ornament from CFSI, you will support the mission of CFSI as well, which is to educate members of Congress about the role of our nation’s fire and emergency services. To find out how to purchase your ornament, please contact Steven Tramel at [email protected] or CLICK HERE TO ORDER YOURS TODAY!